Patients that have diabetes should have a full eye exam every year. It is covered by OHIP once a year. How does diabetes affect the eyes and vision? There are two major types of diabetic retinopathy: nonproliferative diabetic retinopathy (NPDR) andproliferative diabetic retinopathy (PDR). Many diabetics have mild NPDR. NPDR is an early form of eye disease which usually does not affect vision. 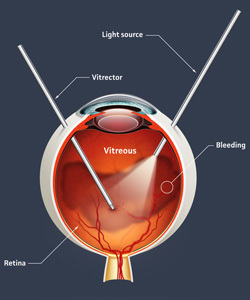 PDR, on the other hand, represents more advanced disease and can cause severe loss of central and peripheral vision.